For more than thirty years, Angela Gillespie has sent friends and family around the world an end-of-year letter titled ‘Hello from the Gillespies’. It’s always been cheery and full of good news. This year, Angela surprises herself – she tells the truth . . . The Gillespies are far from the perfect family that Angela has made them out to be. Her husband seems to be having a mid-life crisis. Her grown-up twins are having career meltdowns. Her third daughter, badly in debt, can’t stop crying. And her ten-year-old son spends more time talking to his imaginary friend than to real ones. Without Angela, the family would fall apart. 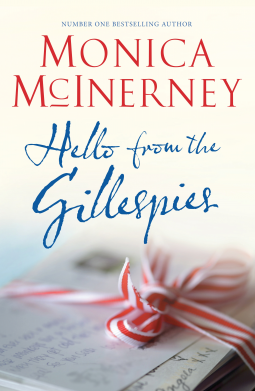 But when Angela is taken from them in a most unexpected manner, the Gillespies pull together – and pull themselves together – in wonderfully surprising ways . . .
From the bestselling author of The House of Memories comes a funny and heartfelt novel about miscommunication and mayhem in a family like no other. Contemporary issues enveloped in a cloak of love. This is such a surprising read – glance quickly over it and you will discover a family story with characters that you identify with or have met along your way in life but this novel is so much more than the individuals in it; it is a story about the struggles of modern day Australians whether they live in regional or city communities, for all the issues here affect us all in one way or another. Aside from a family that is as functional as any I or you may know, with adult children returning to the family home, midlife crisis’s, relationship issues, communication break downs, career crisis’s and the various stresses of modern life we meet a family that is also dealing with a tough life on the land; drought, potential mining on agricultural land, depression, isolation, to name a few issues, throw plenty of challenges into this mix. But it is not a depressing story – it is a heartfelt story peppered with humour and a touch of romance or two and hope – it is about life. But more than these issues this is a story of a family and a mother who has recently discovered she has lost her own sense of self; she has been swallowed up by the social and physical environment she lives in and by her role as mother. For me this is the pivotal part of the narrative. Monica McInerney shines a subtle light on issues that mature aged women face today; life can stagnate, women especially become caught up in supporting all those around us leaving little energy or time for themselves. The joy of life can be missing. You can read this novel lightly and enjoy a palatable tale of rural life and crazy exploits. You can read it on the train or plane or by the beach. You will enjoy the sense of fun and the satisfying conclusion. You can choose to look deeper, at the issues it presents and you can think and learn and maybe decide to talk, really talk and listen; to your mother or sister or good friend or your husband or partner and really get to understand some of what they are thinking. This entry was posted in Contemporary Fiction, Post Script: Book Reviews and tagged Australian Women Writers Challenge 2014, depression, families, identity, rural fiction. Bookmark the permalink. It was Margot – I haven’t read this author before but I like her style and her voice and will look out for her earlier works. I’ve read a few of Monica McInerney’s books and she does tend to get to the deeper issues but still makes her books very readable. This is another one on my ‘must read’ list. Loved this book and loved that I Had the opportunity to meet Monica on her recent trip here! Oh yes I am very lucky…such a beautiful lady! Do you live in SA?